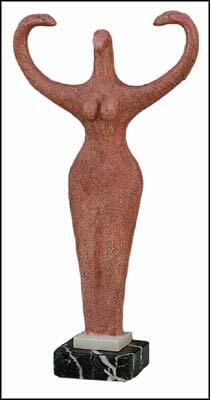 Nile river goddess, venus, venusses, goddess, prehistoric goddesses, nile river, goddess statues. Brooklyn Museum of Art, New York. 4000 B.C. The image of the bird Goddess appeared in Egypt in early predynastic times (4000 b.c.) as funerary figures with strongly beaked faces and winglike arms and hands. These painted terracota figures, less than a foot high and much alike, were found in graves in Mohamerian, near Edfu. They serve as a superb blend of bird, woman and deity. Their greatly enlarged posteriors are a representation of the cosmic or primal egg. In Egyptian myth, the generation of the primal egg takes place in what is known as the time of non-being where the sublime goose appears among the imperishable stars. While the world is still flooded by silence, the voice of the great cackler breaks the stillness, and she lays the egg containing the germ of life. From her egg burst forth a bird of celestial light. The cosmic matter from which the universe is formed comes from the primal egg.